Sleeker and meaner, BMW has designed the new 2012 BMW 3 Series Sedan with a lower profile, nicely-defined indentations in the panelling, a bulgier bonnet, tapered headlights and lots of power. Power is backed up with better fuel economy across the range – thanks to Start/Stop engine technology and brake regeneration. After a drive in one of these, you’ll find yourself impressed with the BMW 3 Series Sedan. Excellent interior design and ergonomics give the BMW 3 Series Sedan the big tick for comfort. Superb seats provide supple support, good legroom and a great feeling over the long haul. The BMW 3 Series Sedan is designed to be driven, and it’s great to be able to enjoy a car for lengthy periods on the road and still be able to walk around afterwards without major stiffness. BMW has equipped all of the 3 Series Sedan models with cruise control, so there’s no need to worry about speeding tickets. Inside the car’s interior, there is a feeling of premium quality and space. The pleasant interior colour tones give the cabin a light, fresh appeal. I love the thought that has gone into this car – with even the glass being specially moulded with a heat and sun protective layer. Drive the BMW 3 Series Sedan through wet, showery weather, and the clever rain sensors work a treat to keep your vision crystal clear at all times. Slippery conditions are well mastered with other ingenious technology, too. BMW’s Dynamic Stability Control (DSC) manages the ABS, Brake Assist, Cornering Brake Control and Traction Control to ensure that all four wheels are sticking to the task of holding the car firmly on the road. You can easily plant your right foot in the wet and enjoy the way the new 3 Series Sedan computes itself a steady course. Five-star safety is embedded throughout the BMW 3 Series Sedan. This has to be one of the safest mid-sized cars on the road. Three point seatbelts throughout the car boast load limiters and pre-tensioners. Driver and front passenger airbags, head airbags in the front and rear, and side airbags for the driver and front passenger come as standard items. A central locking system boasts an electronic immobiliser and crash sensor. The fuel lines are sealed off in the event of an accident. As mentioned earlier, the DSC is a gem; and with the onboard wizardry combined with the BMW 3 Series Sedan athleticism you have a very safe feel about the way the mid-sized Beemer goes about its business. All BMW 3 Series Sedan versions come with a premium eight-speed automatic transmission that’s as smooth as butter and as on-to-it as a any top heading dog. At the instant you require a quick squirt of acceleration, the response of the transmission cleanly selects the optimum gear for the correct level of work required. Even the BMW 318d and BMW 320i are exceptionally apt at showing a clean pair of heels. All BMW 3 Series Sedan models are leaders in fuel efficiency. 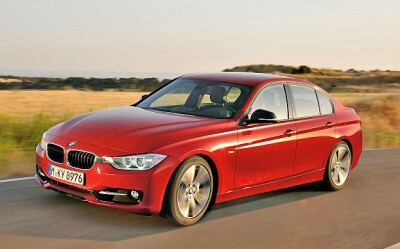 Both of the diesel versions, the BMW 318d and BMW 320d, claim a combined fuel consumption figure of 4.5 litres/100 km. What is very impressive, is that the quickest of the 3 Series Sedan’s, the BMW 335i, manages a limited top speed of 250 km/h, a 0-100 km/h top acceleration time of well under seven seconds, a 400 Nm punch, and a combined fuel consumption of 7.2 litres/100km. I reckon we all enjoy a good bit of luxury from time-to-time. Leather seats; electric seat adjustment with memory; electronic memory of personal profiles; a Radio BMW Professional audio system that includes a 6.5-inch colour display, iDrive controller, six speakers, six programmable memory buttons and an MP3-compatible CD drive; and an on-board computer with Check Control, fuel consumption information, fuel range, average speed and outside temperature on the Info Display are items available to all models. Bluetooth technology keeps you in touch. There are bigger more complex audio systems available; perhaps the best being the Harman/Kardon surround sound system with 16 high-end loudspeakers, a 600W digital amplifier with an individually adjustable equaliser, 9 channels and chrome applications, 6 programmable memory buttons and an MP3-compatible CD drive (standard on 335i Sedan). Plenty of amazing options are available, so do check these out before you buy one of the new BMW 3 Series Sedans. For any more information on the 2012 BMW 3 Series Sedan or, for that matter, any other new car, contact one of our friendly consultants on 1300 303 181. If you’d like some fleet discount pricing (yes even for private buyers! ), we can submit vehicle quote requests out to our national network of BMW dealers and come back with pricing within 24 hours. Private Fleet – car buying made easy!